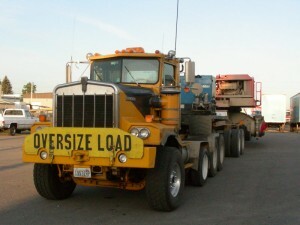 The mission was to meet a truck in Spokane, take some photos of the truck and the mining equipment it was hauling. The company wanted to get the photos on the website. Accustomed as I am to accepting time-consuming projects that promise adventure but lack any remuneration, I readily accepted the task. Besides, this was my kind of mission: big trucks and big equipment. My son agreed to go with me on the premise I was buying breakfast when the mission was over. And, he also is a sucker for big equipment. I awoke early, drove to his house and we went from there together. We arrived in an industrial area where the truck was parked behind a commercial tire store, just as the sun was waking up the valley. You could hear the whistles and hammers in the steel yards and the sound of equipment, trucks and people. The freeway roared behind us and the smell of diesel was in the air. The noise and the smells brought back memories of my childhood. Every summer, I would spend a week or two with my maternal grandparents. They owned an upholstery shop in the port of Tacoma and I would go to work with them. They made the seats for Bellboy and Sabre Craft boats in the sixties and seventies. Most the time, I would play in a room that was full of scrap wood and carts; riding on the carts and making things out of the wood. Some of the time, I would stand in the entry and watch the scrap-iron crane with its magnetic boom. There were barges and tugs and ships to watch, as well. The whistles, the equipment, the people, the noise, the smells – I cherished it all. Because the driver had not yet arrived, my son had to listen to my story. I remembered a small cafe at the port. It had lots of glass windows in the front and the sloping, flat roof that was common and modern back then. My grandparents went there for lunch and often would meet others. They talked about everything under the sun; business and such, while I ate my usual burger with fries. They talked a lot about Khrushchev and the Russians. It sounded serious and dangerous to me but I resolved not to worry. The truck and trailer and mining shovel were impressive. This was a heavy duty Kenworth model C500 with fourteen wheels. That is, fourteen wheels on the truck – not the truck and trailer. This is a big truck with the square fenders. It looks tough, like a Norwegian Viking. It is licensed for 105,500 pounds and the load it was carrying was almost twice that. The Arnes trailer was ninety-six feet long with twenty-eight wheels. 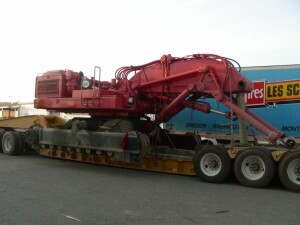 The belly of the trailer was just over four feet wide and upon it straddled a Terex O&K 40-C mining excavator; a front shovel machine that weighs close to one hundred tons and spread over fourteen feet wide. However, this one had the tracks, the shovel and the cab removed, so that should save a couple pounds. The combination had traveled from the northern part of British Columbia; so it had over fifteen hundred miles of dirt on it. Regardless, we took a few shots while we waited for the driver. It wasn’t long before he pulled up in one of the pilot trucks. He had his breakfast with him: a can of pop and two Hershey’s Chocolate bars. I wouldn’t want to be riding with him right about ten o’clock! The driver stood over six foot tall, had a husky build and a head of red hair. An Irish pilot on a Norske Kenworth; that is a combination. He immediately declined any photo shots of himself. So we started talking about the website and he wanted to make sure we understood, he doesn’t use computers but he wants people who do use computers to be able to find him. “Computers are the downfall of this nation,” he said with his chin set out. “Well, before the computer, they worked and then came home and watched TV. There’s not a lot of difference.” I postured. What could I say? That was hard to refute no matter where you started. We talked a little more on the subject and it was clear in his mind, our country was not suffering from a moral crisis. We had too much computer time and it is the ruin of us all. However, he is going to put computers in his fleet of five trucks because he’s heard about this software that will help him operate more efficiently. If he can save enough time and money scheduling loads, filing log books and documents, avoiding toll roads and running fewer miles, maybe he will have time to take up a hobby – but I don’t think it’s going to be surfing the web, or drinking. This entry was posted in stories and tagged alcoholism, bellboy, boats, british columbia, cougar gulch, hauling, heavy equipment, irish, k40c, mining equipment, mining excavator, norske, port, red hair, sabre craft, semi-truck, stories, tacoma, terex. Bookmark the permalink. Both comments and trackbacks are currently closed.